Vasquez Rocks | Agua Dulce, Calif. The "other" Vasquez Rocks art: These paintings were rendered at the Rocks in Agua Dulce in the 1930s or somewhat earlier by Claude Ellis, a chemist with the Fuller Paint Co. According to historian Jo Ellen Rismanchi, Ellis tested paint compositions and durability by applying his mixtures to the rocks  which were owned by his friend Henry Krieg, who homesteaded the property in 1910 and died there on May 24, 1937. 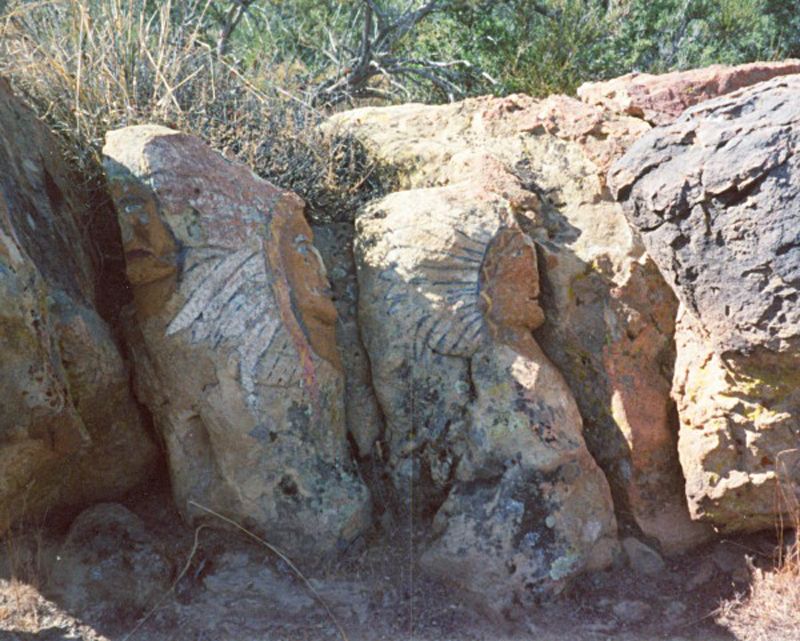 Ellis envisioned characters in the rocks and brought them out, often by painting eyeballs where he saw a naturally formed face. And where the rocks didn't exactly fit his vision, he lightly sculpted them, as is evident in the row of Indian faces in this series. JE3001: 19200 dpi jpeg from smaller jpeg from original print.